American politician, born in rural Kentucky in 1835, not far from Covington. He was the eldest child in a large family, received a common school education, studied law, and taught for a time in Covington and elsewhere. He was admitted to the bar of Kentucky in 1858, and served a single term in the Kentucky house of representatives, while acquiring an extensive and lucrative law practice. During the Civil War he was opposed to secession. In 1866 and 1869 he was a member of the state senate. He was a delegate to the Democratic National Convention held in New York in 1868, was Lt. Governor of Kentucky, and in 1876 was a presidential elector. The same year he was elected to the US House, taking his seat in March, 1877, and he was seven times re-elected. He soon became prominent as a Democratic leader, was appointed a member Ways and Means Committee, and attracted attention by an able speech on revenue reform. This and the revival of American shipping he regarded as the most important questions before the country. In December 1883 he was elected Speaker of the House, to which office he was re-elected in 1885 and 1887. He was one of the most popular men in his state, politically, and might have had a seat in the US Senate had he not preferred to retain the leadership of the house. His service as Speaker was noteworthy for his clear-headed and even rulings, none of which were ever reversed by the House. During the 46th Congress his internal revenue bill made him the recognized leader of his party on the question, and in all succeeding tariff debates he led his party both in and out of Congress. In 1890 he was chosen Senator to succeed James Beck, and he served until he was appointed Secretary of the Treasury in President Grover Cleveland's cabinet in 1893. He shaped the financial policy of Cleveland's second administration, and was active in explaining it and supporting it with vigor and ability. 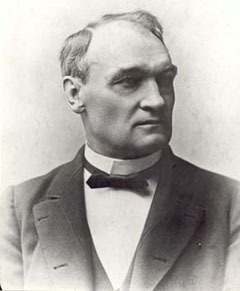 After the close of the administration, Carlisle moved to New York City. His reputation will, perhaps, rest principally on his clear and able advocacy of revenue reform in congress. He said in 1882: "I do not hesitate to announce my adherence to that creed which demands the largest liberty in trade, that doctrine which opens the channels of commerce in all parts of the world and invites the producer and consumer to meet on equal terms in a free market for the exchange of their commodities, for I sincerely believe that all commercial restrictions are in the end injurious to the interests of the people."